Winnie was designed by accident when I was designing a head for my miniature Hunny Bear (Winnie the Pooh. See the original post here). One of the heads turned out too long for my bear but was too cute to trash. I knew I could turn it into something else and that's how Winnie was born. page for the written pattern. I hope you enjoy! 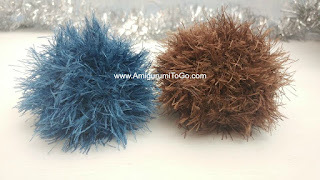 Eyelash yarn in any color for the spines. Don't be afraid! 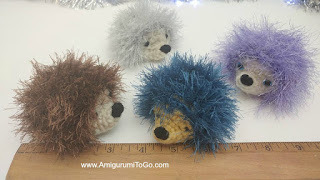 This yarn is added after the body is done and is fairly simple to do. Black yarn or embroidery thread for the nose. Use yarn for eyes or dot in the eyes with black paint. Eyelash yarn is called different things in different yarn companies. Red Heart Yarn used to have eyelash yarn called Foxy but it has been discontinued. I have a few rolls in my stash. Lion Brand calls it Fun Fur. It looks pretty much the same for each brand. They come in all sorts of colors. 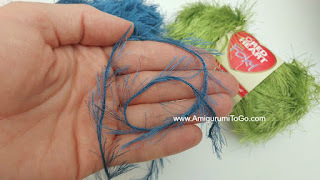 f/o leaving a tail for sewing. Weave in and out of the remaining stitches, stuff more into the body as needed then pull yarn tail to close gap. Knot off and hide yarn tail inside body. Nose and eyes. Add these before the spines. Nose: Pull black yarn through from the back end and out through the center hole of row 1. Wrap around the top of that row a number of times until you have the size of nose you want then bring the yarn tail back through and out the back end. Eyes: carry the yarn back through and come out in between the 4th and 5th row. Count the rows starting at the top of the nose, not the bottom. 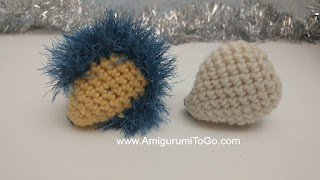 Wrap the yarn around a little bit of yarn to make a spot for the eye then bring the yarn needle into the head and out where the other eye will go, wrap a spot then back through the body and out through the back end of the body. Knot off and hide yarn tails inside body. Set the body down on a flat surface, note where the body and the flat surface meet. You will start here and end here for every row. You could even mark this line lightly with a pencil if you feel that would make it easier. Insert your hook under a stitch post, in between the 5th and 6th row, at the start of the spines' line, pull the eyelash yarn through, ch2 and 1sc into the next stitch hole, ch2 then 1sc in the next st hole, repeat across the row to the line on the other side. If you don't ch2 between each sc then the spines will not be as full. At the end of the row ch2 and repeat the same steps on the next row and so on for each row until you get to the back end. I found it easier to make a line with the eyelash yarn across the bottom but you don't have to do it that way, you can keep going around until it's all filled in. If you want to do the same as I did then once you reach the back end (between row 11 and 12) repeat, ch2 and 1sc in the next st, across the bottom of the body in a straight line to the other side then continue going around and around until the back is all filled in. It's a little bit more effort to get your hook where you want it to go in this area but it's still easily done. After you have finished adding the eyelash yarn run your needle across each row, back and forth, to release all the fibers that were caught when you crocheted them. Or pull at them with your fingers. This will fluff up the hedgehog. After that you shouldn't be able to see the body underneath the eyelash yarn unless you dig for it. Happy Christmas, Sharon! And thank you for your generosity all year around. 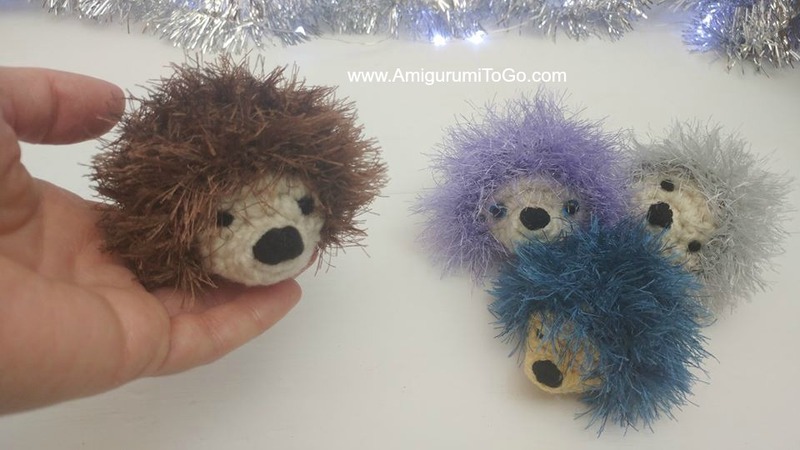 Could you get the same or similar affect on the quills if you use just regular yarn?